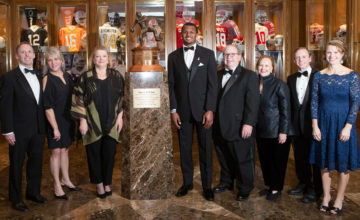 FORT WORTH, Texas (Oct. 10, 2018) – Texas sophomore Sam Ehlinger has been named the Davey O’Brien National Quarterback of the Week for week six, the Davey O’Brien Foundation has announced. Ehlinger steered the Longhorns to a 48-45 victory over No. 7 Oklahoma on Saturday, the most points ever scored by Texas in the 113th edition of the Red River Showdown. The native of Austin, Texas, accounted for five touchdowns and 394 yards of total offense. The yardage total was the most ever by a Longhorn player against the Sooners. Through the air, Ehlinger was 24 of 35 passing for 314 yards and two touchdowns. 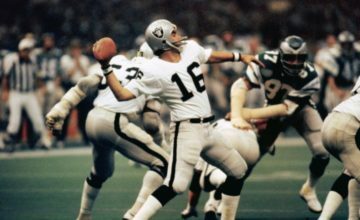 He also carried the ball 19 times for 72 yards and three scores, and had one reception for eight yards. For his efforts, he also has earned Walter Camp National Offensive Player of the Week, Maxwell Award Player of the Week and Big 12 Conference Offensive Player of the Week accolades. 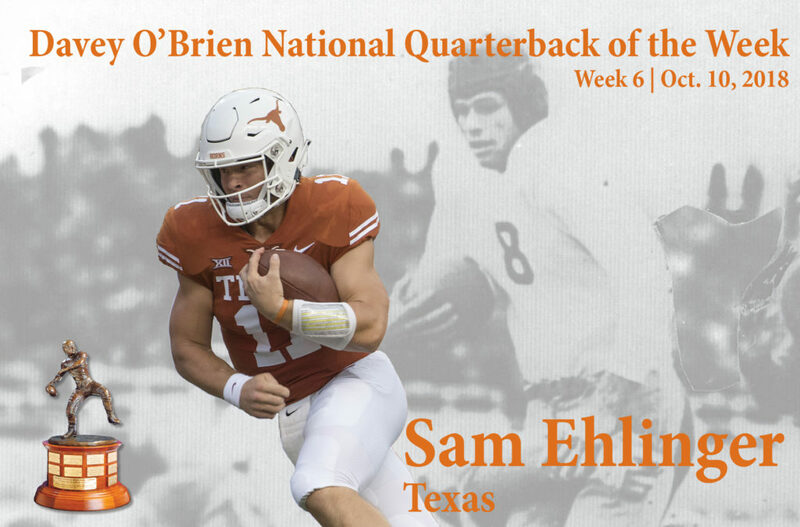 Ehlinger is the fourth Big 12 Conference quarterback to be named the Davey O’Brien National Quarterback of the Week this season. 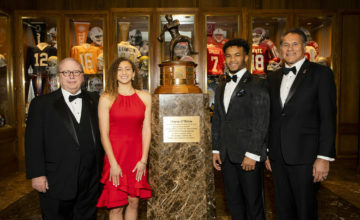 The Punt & Pass Podcast hosted by Drew Butler and Aaron Murray will discuss Ehlinger’s achievement on Thursday’s edition of the show. The other Great 8 quarterbacks in the season’s sixth week were: Nick Fitzgerald of Mississippi State, Ohio State’s Dwayne Haskins, Jordan Love of Utah State, Iowa State’s Brock Purdy, Brent Stockstill of Middle Tennessee, Alabama’s Tua Tagovailoa and Clayton Thorson of Northwestern.